When I was a kid, my family made fun of me for smelling bread. My mom would buy a baguette at the grocery store, and before eating it, I'd smell it to see if it was sour. I didn't like sour bread, so I had to make sure I didn't accidentally eat some, since it looks just like regular bread. 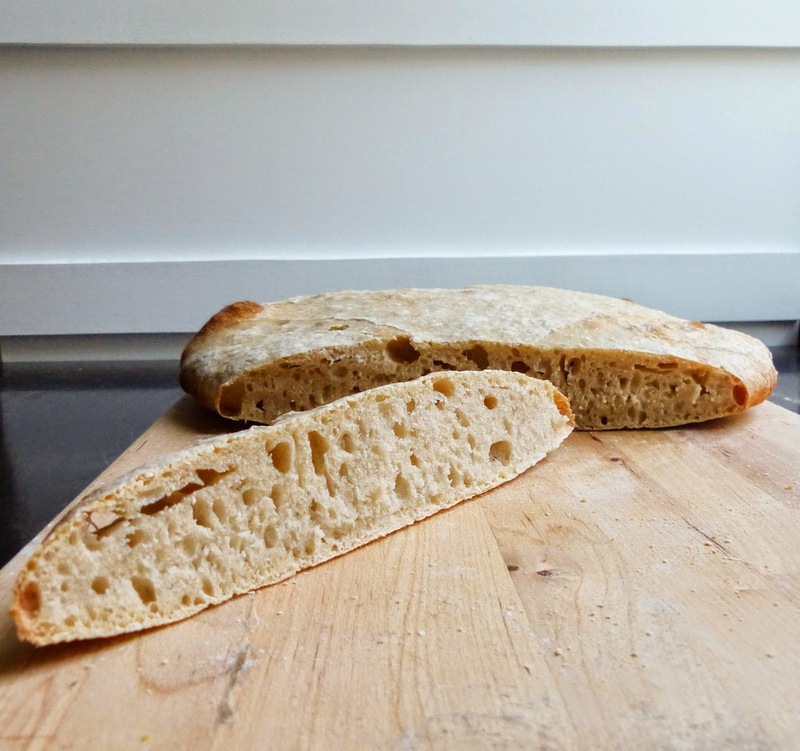 However, after moving to San Francisco 3 years ago, I fell in love with sourdough bread. It's so amazing, I don't know why I never liked it before! Maybe I never had truly good sourdough until now. So I was especially looking forward to making it myself. The last time we made a boule, I had problems with the shape. And again this time. I find the instructions for shaping to be really vague and confusing. I also had to use a ton of flour to keep the dough from sticking to anything and everything. 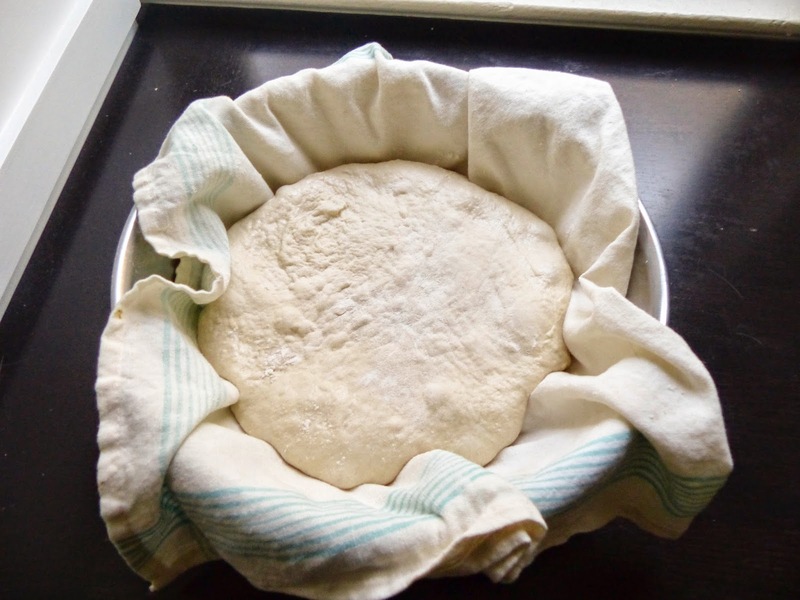 After the proofing, the dough was bubbly and big, but when I inverted it onto the baking peel it totally deflated and spread out a lot. 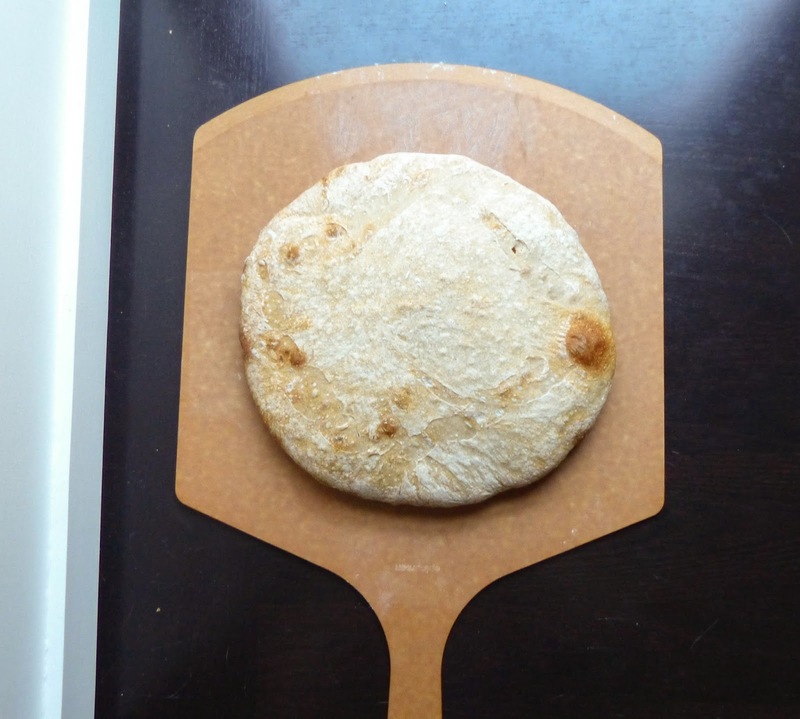 It was really flat, but still round. I got it onto the baking stone in the oven and hoped for the best. When it came out of the oven, it was still flat, and it didn't get dark at all. It was quite disappointing, especially because it takes all day to make this bread. I tasted it, and it was sour and crusty and yummy, although the crumb wasn't light, it was too dense. I immediately decided to re-make this bread the next day. 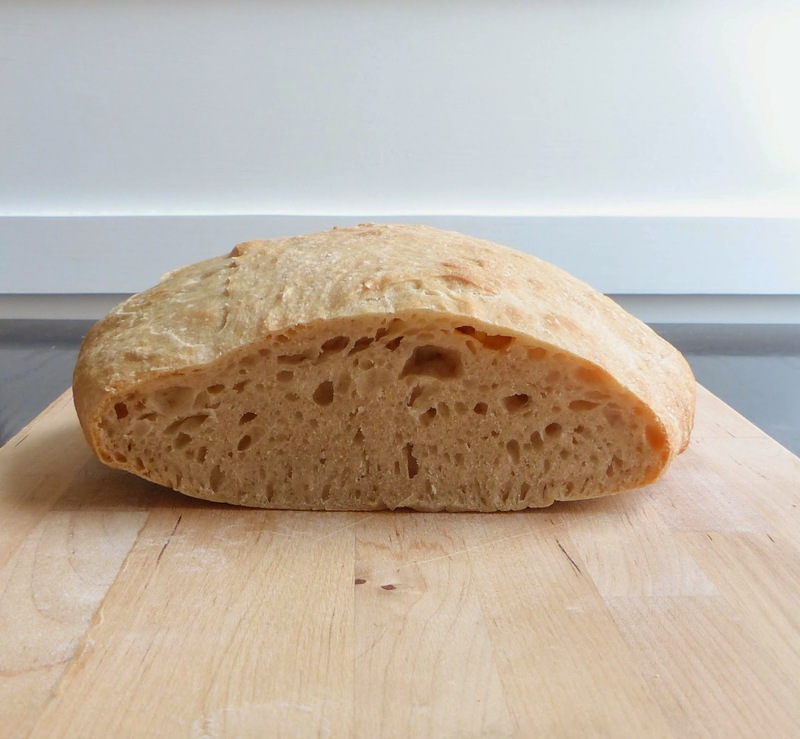 I looked up a bunch of videos online to see how to properly shape a boule, and got a lot of good tips. So the next day I set at it again, this time using a different shaping technique. 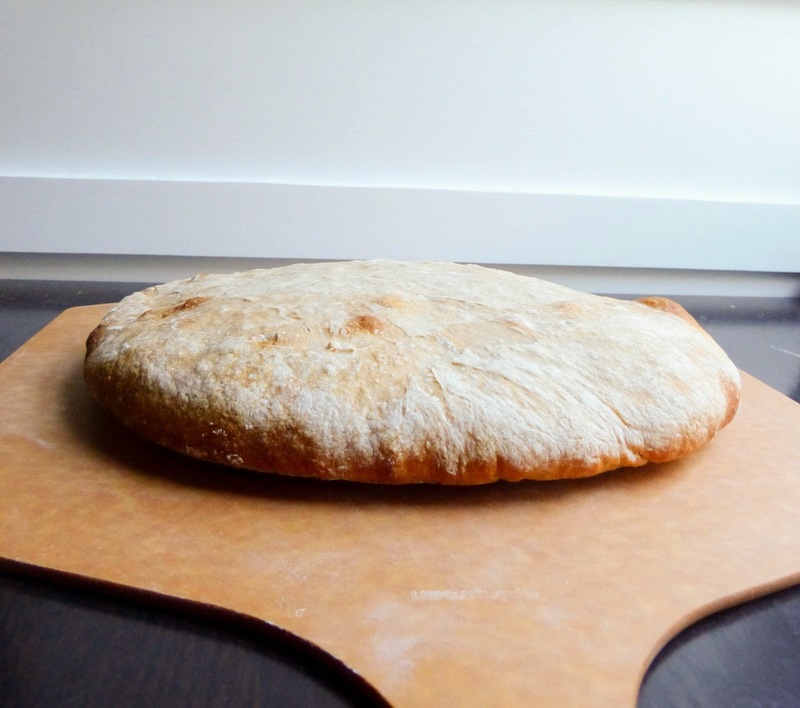 It did make a more rounded boule, but I again had to use too much flour to keep it from sticking. 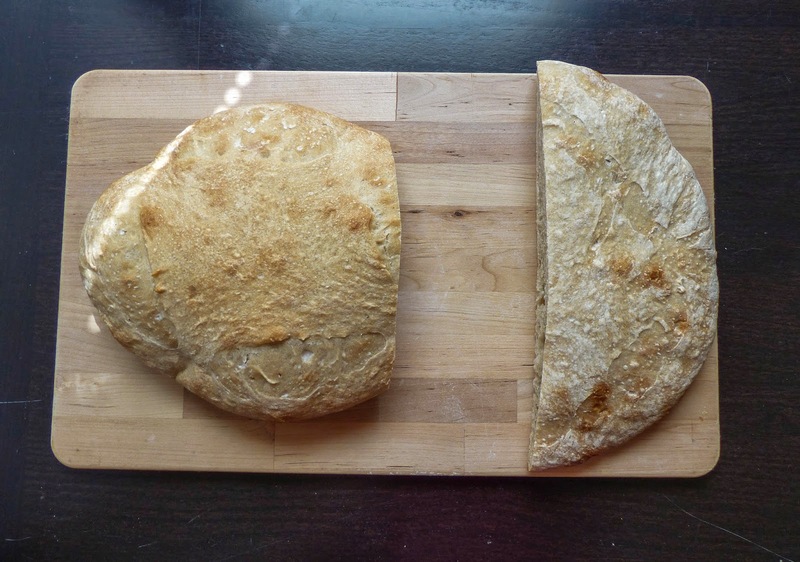 When transferring it to the baking stone, the dough lost some of it's shape, becoming a bit lopsided instead of perfectly round. It also didn't brown enough, although it was cooked inside. While it looked better than my last attempt, it was rather bland and tasteless, not sour at all. I think the reason neither loaf browned well is because of all the flour I used. I just don't know how to get around that, since it's a sticky dough. I definitely need more practice making this bread, but I think two loaves in two days is enough for now. 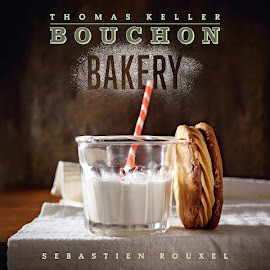 I'll have to revisit this in the future, and in the meantime, continue buying my sourdough at one of the many amazing local bakeries.